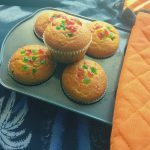 Eggless Orange Tutti frutti Muffins – Fruity Orange muffins with a combination of tutti frutti. Muffins are my favorite baked recipe. They are easy to make, require only a handful of ingredients and they get baked in a small amount of time. You can experiment with them a lot. They are a great dessert. They are also a great option for breakfast. They don’t require any additional preparations. In all, they are a nice thing to try. This time I tried baking Orange Muffins. To add a little more flavour and taste to them, I added a handful of tutti frutti to them. tutti frutti is such a nice ingredient. It easily increases the taste of any baked sweet dish. The combination of tutti frutti and orange is really great. The recipe is quite simple. We firstly sieve all the dry ingredients(all purpose flour, baking powder and baking soda) together. Add tutti frutti and mix using a spatula so that the tutti frutti gets covered with flour. Keep this aside. Now, we will grate oranges to take out orange zest. remember – grate only the outer orange skin and not the inner white part. the white part is bitter and would hamper the taste of your muffins. We also need orange juice for these muffins. You can either use a juicer for taking out orange juice. If you do not have a juicer then just blend the orange slices in a food processor/blender. After this sieve the juice before using. Also, remember to remove the orange seed before blending the orange slices. Otherwise the juice will taste bitter. Now take oil and sugar in a mixing bowl. We will whip them for approximately two minutes. The next step is too add the orange juice. Again mix this mixture. We will also add the orange zest at this time. Now we will add the dry ingredients into the wet ingredients. Mix well, with the help of a spatula till a smooth muffin batter is formed. We will then add the muffin batter into the muffin moulds. I have also added some tutti frutti on the top of the muffin batter for further decorating them. We will bake these orange tutti frutti muffins at 180C/350F for 15 – 20 minutes or till a toothpick inserted into the centre of a muffin comes out clean. Do try this recipe. If you have any questions regarding the recipe feel free to ask them in the comments below. Eggless Orange tutti frutti muffins - Perfect fruity muffins. 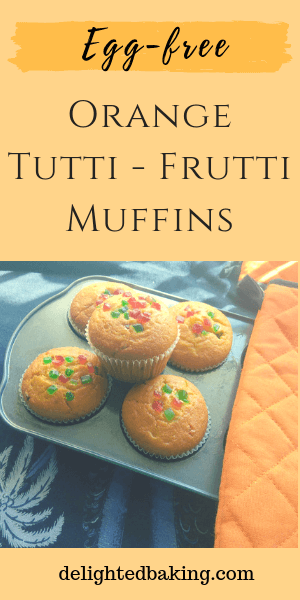 Tutti frutti and fresh oranges give these muffins an amazing fruity taste. Preheat the oven to 180 C / 350 F. Grease the muffin tray nicely with oil. Place the paper liners in the muffin tray. Now sieve together flour, baking powder and baking soda. Add tutti frutti and mix well so that all the tutti frutti get covered with the all purpose flour. Grate oranges to take out orange zest. NOTE - Grate only the outer orange skin and not the inside white part. The white part would be bitter and would hamper the taste of your muffins. Also take out orange's juice. Using a juicer, take out the juice. If you don't have a juicer, then just blend the oranges in a food processor. After this, sieve the juice. Take oil and sugar in a bowl. Mix nicely so that the sugar gets mixed nicely. Now add the orange juice. Mix properly. Add the orange zest and mix together. Now add the dry ingredients. Mix nicely. Add the muffin batter into the muffin tray. You can fill it till the top. Put some tutti frutti on the top. Bake for 20-25 minutes at 180 degree centigrade. Orange tutti frutti muffins are ready!